Get ready to step into some of your favorite Pixar stories! You may remember that we’ve been staying up-to-date with all the new updates to Pixar Pier, and now we’re excited to share the first glimpse into the four neighborhoods that will make up the heart of Pixar Pier! As guests take their first steps into Pixar Pier, they will enter through an archway with The Incredibles logo lingering overhead. You are invited to enjoy your Disney days in the plaza inspired by “The Incredibles” and mid-century modern design aesthetics. 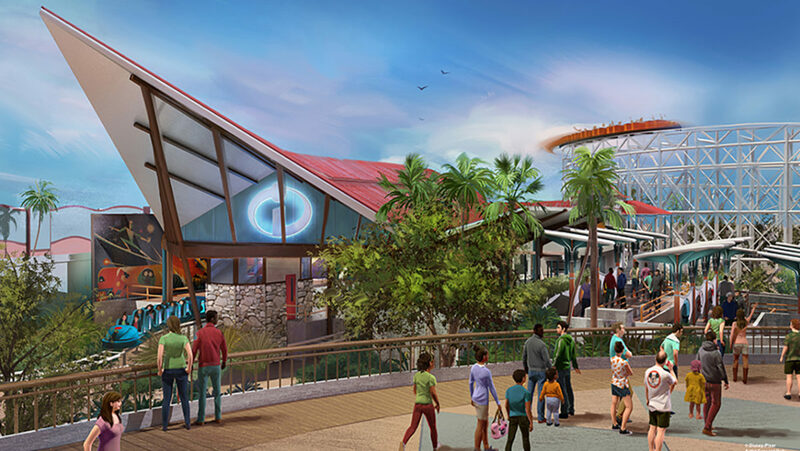 On top of the beautiful design, head on over to the new Incredicoaster and get your mission to race with the Parr family! Fuel up for the rest of your Pixar Pier adventure after you exit the ride with freshly-baked treats at Jack-Jack Cookie Num Nums stand. As you leave the super world of “The Incredibles” join your pals from “Toy Story” as you step into the next neighborhood! Guests can enjoy snacks from Poultry Palace and snap a fun-size photo with Zurg posing just outside the stand! On your way to Jessie’s Critter Carousel (opening 2019), grab a churro from Señor Buzz Churros and prepare for even more fun! Enjoy the sights and sounds of the beautiful seaside pier while enjoying the heart of Pixar! Take a ride on the focal point of Pixar Pier, Pixar Pal-A-Round, while looking down at the whimsical neighborhoods below you. Also lining the pier will be the Games of the Boardwalk. These games have been rethemed to reflect some of our favorite Pixar tales. Be sure to catch Heimlich’s Candy Corn Toss, Wall-E Space Race, La Luna Star Catcher and Bullseye Stallion Stampede all coming to the pier this summer. Along with fun activities, there will be a stage set up to house exciting musical acts or moment with your favorite characters. Grab a sweet street from Bing Bong’s Sweet Stuff and grab a spot to watch all the fun take place! Looking for something a little more savory to get you through? Check out Angry Dogs, spicy dogs inspired by Anger from “Inside Out” himself! Rounding out the charming pier will be a colorful area inspired by “Inside Out!” Bring the whole family to experience the playground featuring the emotions from Riley’s head. Be sure to keep an eye out for a new family-oriented attraction that will be announced soon! Looking forward to the beginning of the new Pixar Pier? Be among the first to experience the sights and sounds at the Pixar Pier Premiere Party June 22. Be sure to check out Disney California Adventure Park when everything is officially unveiled June 23! What story are you most looking forward to seeing? Let us know!